There is a seasonal flu which seem to be affecting A LOT of our local residence in Dominica. Yes even our host, the healthy eating Mitchel Junosuede-John. However, as he said in this week's impromptu video, he might have become a victim of the flu, but he is able to move about more, when compared to other flu victims, because he eats healthy, he grows what he eat and eats what he grows. As the motto goes "A BACKYARD GARDEN IN SOME WAYS WILL KEEP THE DOCTORS AWAY!" Now what can you do AFTER you have been infected with flu? How can you heal faster? How about simple consuming a natural product which you can grow in your very own backyard? This plants contains essential nutrient which is needed in the body to have beautiful skin, good hair growth, and even the immune system. As the year comes to an end, we are preparing for Christmas season. Folks are budgeting to purchase gifts, children are biting their nails as they count down the days leading to Christmas day. However, something is missing. Other than the gifts, the songs, the message of Jesus's birth, the decoration and the people something is missing...did you guess "food and drinks"? That is correct, no one can enjoy Christmas without the food and drinks. As a result let's talk about the drinks for a moment and the crop which is known as a Christmas crop. This Christmas crop is known as the Sorrel or the Roselle. The Roselle originated from Africa, west Africa namely. The Roselle can grow in tropical and sub-tropical areas such as the Florida, African, Central American, Southern America and most importantly The Caribbean. The Sorrel can also grow in areas like India, and the Philippines. The Roselle is not a year round plant, because it needs SHORT DAY LIGHT. That is correct. Sorrel plants usually bloom at the end of the year because of the short day light, which mainly happen as the year comes to an end...Christmas season. This may vary around the world. How do you grow the sorrel/roselle plant? How do you use it to make the famous Christmas drink? Good question and the recommended answers are in all 18 video presentation from our YouTube channel (Agrosuede Backyard Gardening). You can watch the video below which is a playlist that contains all 18 videos on how to grow the sorrel seed, how to make sorrel drink, how to make sorrel jam and much more. You can also search on YouTube for "Agrosuede Backyard Gardening Sorrel"
As full moon draws closer, it will affect how your plants grow or what will happen to your plants, from the fruits, to the roots and leaves. On November 14th-15th seeds sown on these days are likely to rot. By this time full moon date is gone, as a result from November 16th-17th are good days for transplanting/planting potatoes, turnips, onions, carrots, beets, and other root crops where climate is suitable. From November 18th-22nd are good days to get rid of those annoying weeds and other pest plants. November 23rd-27th is a favorable time for sowing grains, hay, and fodder crops, root crops (carrots, beets, onions, turnips, Irish potatoes, and other root crops) and to plant flowers. As the month comes to an end, you can now relax and enjoy your garden view, because from November 28th-30th are poor planting days. Growing Cabbage and Tomatoes | Unconventional Practice. There is a chance that more than 50% of persons who practice backyard gardening follow conventional gardening technique such as staking, mulching, watering etc. However, at times we must try to grow crops in an unconventional manner for observation sake perhaps. I decided to growing tomatoes and cabbages in a raised bed without following conventional gardening practice and knowledge. It was a positive outcome with an unusual amount of tomatoes production and invasion of garden spiders which acted as a form of natural pest control. Be encouraged to practice backyard gardening and even unconventional backyard gardening now and again.. It is planting time again, but the question is when to plant? Or what to plant? From October 29th-31st you should start your seedbeds. On October 29th it is a good day for transplanting seedlings such as root crops and leafy vegetables. On October 30th and 31st you should plant above ground crops as these are favourable days for above-ground crops, and leafy vegetables such as lettuce, cabbage, kale, and celery where climate is suitable. However, on November 1st and 2nd these are poor planting days. Do not be dismay, because from November 3rd-5th are good days for planting peas, squash, corn, tomatoes, and other above-ground crops. You can now rest as two poor planting days follow… From 6th-7th is a good time to kill plant pests or do plowing. Now that full moon is gone, it's time to plant your root crops. It is best recommended that on October 17th you should transplant your root crops such as beetroots, carrots, radish and other tuber crops. This is because the moon is now descending which means the moon is not affecting the underground part of plants, even the normal root system of not tuber plants. It is also recommended that you prune plants to discourage growth or to slow down growth from October 17th to 28th. From October 18th and 19th are poor planting days. The seeds sown on these days might not germinate. October 20th and 21st, you can transplant root crops once again. However, October 22nd to 26th are not good planting days, for the most they are barren days, so chance are if you plant on these days your plants would not be fruitful. As a result, it is best recommended that you use these days to kill weed and other gardening work which do not involve planting. Finally, on October 27th and 28th are good days again to plant root crops. Are you planning on starting a backyard garden, do you need to build your planter stand or raise bed? Well you have two good days to do so. On October 10th and 11th are poor planting days as such, these two days can best be used for non planting activities in the backyard garden such as digging, preparing your raised bed, or building a planter. Even install a new water system perhaps. On October 12th and 13th are perfect days for plant above ground plants, specifically vine crops like passionfruit, cucumber, pumpkin etc. However, on October 14th and 15th are barren days, so you can use these days to finish your garden non planting project. As you prepare to plant soon again. Have you ever heard of the Barbadine fruit? . One of the vast difference between the barbadine and the passionfruit is the thickness of the flesh. The flesh of the barbadine can be used to make a drink. It is also used to make punch and ice cream. Avocados come in different shape, size and colour... even taste. Some are small and round, while some are large and round. There are those which are designed like a bottle, with a large bottom but a narrow top. You may have seen some avocados which are red in colour when ripe, while some avocados might be yellow when ripe. Even the smoothness of the avocado peeling varies. Some are soft and thin, while some are rough and thick. Avocados can be eaten raw when ripe, but in Dominica it is popularly consumed with bread or farine. Some folks would use the avocado to make a drink, smoothie or ice cream. No matter how one might chose to use it, an avocado is a good fruit to have on one's plate, or in one's kitchen. 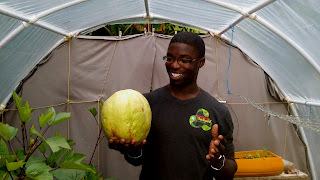 Our Youtube host, Mr. Mitchel "Junosuede" John was on a quest to find the biggest avocado in the Roseau market. 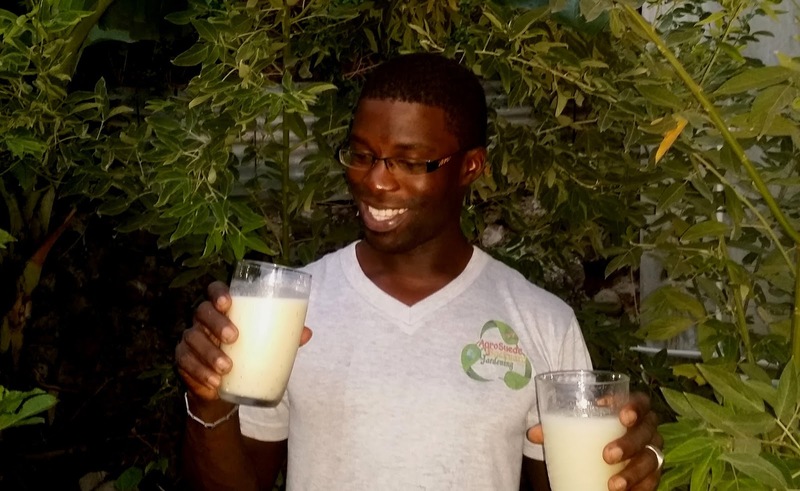 He also decided to record the journey, and unexpectedly he came across The owner for K Vidal's Enterprises, and the owner of Root Farm Organic Produces. He did two short interview which will be published on AgroSuede Backyard Gardening Youtube channel. 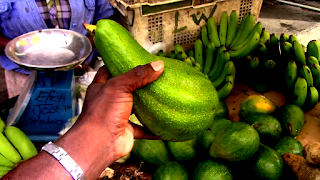 In the meantime a video was publish as part of AgroSuede's impromptu Tuesday video presentation with the title "On A Quest To Find The Biggest Avocado | Roseau Market". Check out this video feature below. Do not forget to like the facebook page, follow on twitter and instagram. You can also send a message to Mr. Mitchel "Junosuede" John on whatsapp number 1 767 617 0224. How To Grow Basil Seedlings From Cutting. Basil is a very easy plant to grow in your backyard garden. One can sow the seeds, or transplant the seedlings. 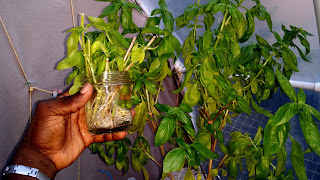 One can also grow the basil seedlings from cutting. How is this done you might be asking? Simple...Cut off a short branch from a basil parent plant. Remove all the big leaves, then remove all the lower leaves and put the cutting in clear and clean natural water. Natural water is recommended instead of tap water. Natural water is water that have not been tampered with, altered or those with absolutely no added chemical, whether it be safe or hazardous. You should also change the water every day to prevent the cutting from rotting. You should note that it is important to cut the branch off the mother plant on or during the 7 days leading to full moon so that the parent plant can restore new leaves and develop new branches faster. If you cut your basil cuttings on the days leading to full moon as recommended, then your cutting should have started to sending out new roots on the night of full moon. As the moon goes down from full moon, the roots should grow longer, faster. NOTE: As the moon rises to full moon status, this increase leafy growth on plants, and when the moon sets from full moon status it encourage root growth.